Preparing your home for Christmas is a very traditional practice and however you choose to style your home the process is always a very personal one. For me, it's a special moment to be shared with loved ones and a time when our home becomes a little more colourful. There are probably storage spaces in your home you refuse to open the door to unless you absolutely have to. When it’s time to drag out the decorations use it as an opportunity to declutter this space. Recycle and donate unwanted decorations and other miscellaneous clutter before considering adding more to your home; you might find all you need for decorating is hidden away in those boxes. Decluttering this storage space makes life a lot easier when it comes to hiding it all away again. We have one large storage cupboard in our apartment and when I’m rescuing Christmas decorations from their boxes I take the opportunity to remove everything from this space so I can get rid of what we don’t need and return it all to order. I often find we have more than enough to prepare our home for Christmas. Creating a cosy, warm environment to relax in is what I consider to be the most crucial part to preparing your home for Christmas. Pull all your spare blankets out of storage, adjust existing lighting and add a little extra with string lights or lamps, and a few candles with rich scents to create a cosier atmosphere in the home. With a few simple changes and attention to detail you can prepare your home for Christmas with very little effort. Lighting is especially important. Twinkling lights strung on the tree, hanging from the ceiling, or draped over bookshelves when space is limited, is a traditional way to add festive spirit into the home. After struggles with hanging lights and spare plug sockets, we chose a dome light display and hurricane candles, angling the floor lamps upwards to throw out warmer lighting. A simple trick that makes a world of difference. Adding blankets to living room seating and extra throws on the beds is an instant way of creating a cosier, more inviting home especially in winter. We’ve tucked a light grey wool throw over the sofa for guests to pull down and wrap around themselves. In the bedroom a more heavyweight cotton blanket placed over the sheets provides a warm space we can relax in as the nights grow colder. We chose plain throws to fit in with our decor all year round but you might want to opt for something more festive like this red check throw or tapestry bedspread. Decorating need not be an arduous task. There are simple yet effective ways to decorate your home without spending hours moving furniture, hanging lights, and setting up tabletop displays. With a few tweaks, preparing your home for Christmas can be effortless. If you live in a colourful home already perhaps a colour scheme isn’t necessary; for minimally styled apartments like ours, choosing a handful of colours to stick to when decorating results in a sleeker appearance. We typically keep decoration around our apartment to a minimum and like to opt for those that wouldn’t appear out of place if kept up all year round. We have very little space and without caution decoration can lead to overwhelming clutter; simple changes I find are the best. I’ve rearranged our coffee table to reflect the festive mood with a few simple Christmas touches: a felt Christmas tree, a winter scented candle, and a little greenery. A tradition in our family is to add new decorations to the tree each year resulting in a memory-filled (if a little chaotic) tree display. 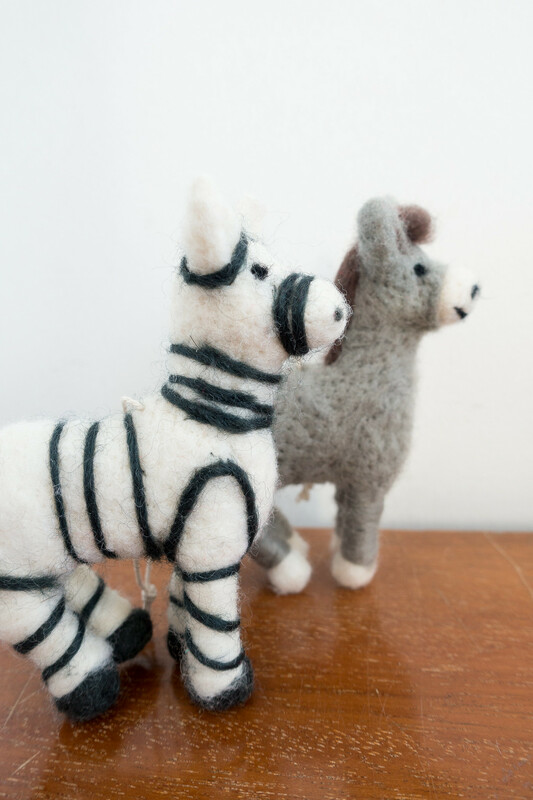 The latest arrivals are these felt animals, a little donkey and zebra, and giant pompom decorations from the John Lewis Grand Tour collection. If you prefer to keep decorations to a minimum, a real tree with beautifully wrapped presents underneath is a simple way to decorate with very little fuss. A traditional tree naturally becomes the focal point and fills the space with a beautiful natural scent. Even though our apartment is small, we opt for a real tree. Although it temporarily takes up more of our living space we don’t have to find room to store it for the rest of the year like we do with an artificial tree and the atmosphere it brings to a home at Christmas is unbeatable. 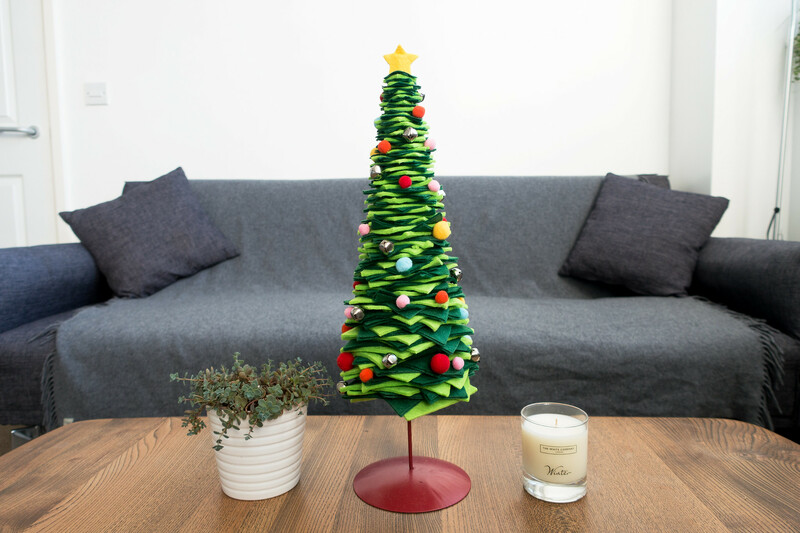 If there’s no room for a tree - artificial or real - there are options when space is tight or you’d prefer not to have needles all over the floor. A tabletop display with candles, greenery, and a miniature tree makes a beautiful yet traditional alternative. 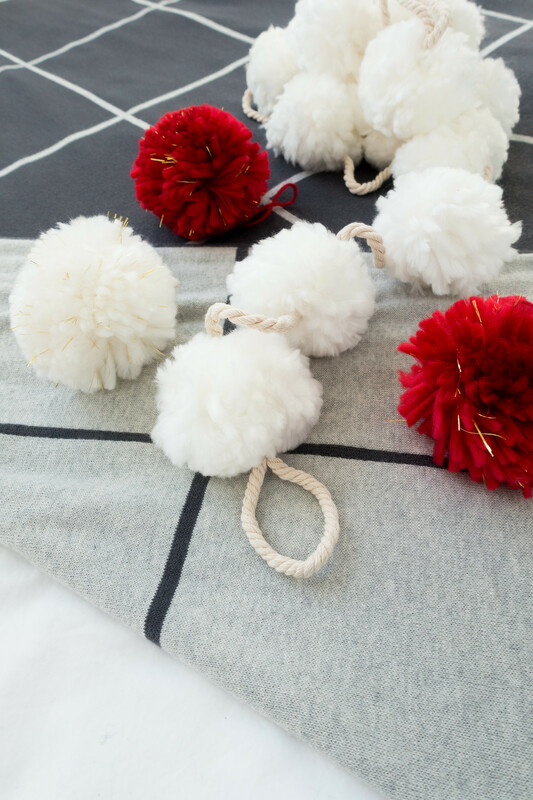 Simple garlands - like this string of pompoms - hung from bookshelves or doors are easy replacements for more cumbersome decorations; and a Christmas stocking hung over the fireplace (or, in our case, simply on the wall) gives a nod to traditional festive decoration. This is a sponsored collaboration with John Lewis.